These Cape Ann attractions are within a 3-mile radius of The Colonial Inn. An ocean-side artists colony, started over 200 years ago and said to be America’s oldest working art colony. Established 1922. Workshops, classes, lectures, auctions, exhibitions, May – October. Guided tours, May 15 – Oct 15, Mon – Fri, 10 a.m. – 4 p.m.
View artwork by some of Cape Ann’s most prestigious artists and sculptors. See fisheries/maritime and granite quarrying galleries. The only working historic waterfront in the Northeast that combines a historic working marine railway, where wooden vessels are hauled and repaired, with a Gulf of Maine aquarium, vessels tracing the fishing history of Gloucester, ongoing construction of wooden boats, and educational exhibits and programs. Sail on the Schooner Thomas E. Lannon. 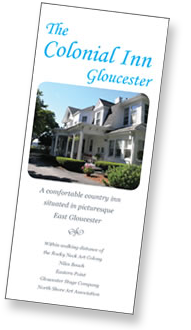 Help the crew raise the sails or just relax and enjoy Gloucester’s scenic coastline. Perfect for private parties and functions. Walk the decks of 1926 Gloucester fishing schooner. Tours, Sunday breakfasts, educational/cultural programs. Pick up the Salty Dog Ferry in Rocky Neck or at the Cripple Cove Dock in East Gloucester. Tour the harbor or schedule a private party. Call (978) 281-4673 for info. Come cruise with us and visit with the whales and other amazing sea life. It is an experience of a life time.